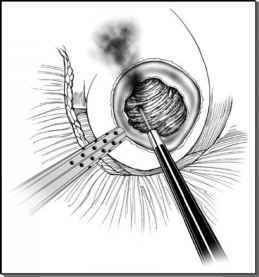 ■ Laparoscopies for the nonpalpable testicle have become the standard approach in many U.S. and European centers. ■ The advantages of laparoscopic diagnosis, localization, and orchidopexy are felt to outweigh the disadvantages. ■ The alternative to laparoscopic localization and diagnosis and laparoscopic orchidopexy is open inguinal exploration and open orchidopexy. However, some investigators have raised serious concerns regarding the reliability of open inguinal exploration to rule out an intra-abdominal testis. In fact, a number of series have reported abdominal testicles identified via laparoscopy after "negative open explorations" (25,35,39-42). ■ A critical assessment of the surgical outcomes of open orchidopexy for the intra-abdominal testicle has shown less than optimal success rates with regards to acute atrophy (43,44). ■ A multicenter review by Baker et al. suggests that therapeutic laparoscopy offers the highest success rate for orchidopexy for the management of the intra-abdominal testicle (Table 1) (35). ■ Laparoscopic orchidopexy like all other surgeries can be associated with complications (35). ■ Many of the complications were due to the practice of blind cannula placement and Veress needle insufflation. Most pediatric surgeons have now abandoned such approach in children. ■ Reported complications include (i) acute testicular atrophy; (ii) bowel perforation (45); (iii) cecal volvulus; (iv) bladder perforation (13); (v) ileus, vas injury, bowel incarceration at the site of the parietal peritoneal closure of the internal ring, spermatic vessel avulsion necessitating an unplanned single-stage Fowler-Stephens orchidopexy (35).